Icelanders have gone to the polls to vote on paying the UK and Netherlands after the collapse of the Icesave bank, with a resounding "No" vote expected. The British and Dutch governments want reimbursement for the 3.8bn euros (£3.4bn; $5.2bn) they paid out in compensation to customers in 2008. 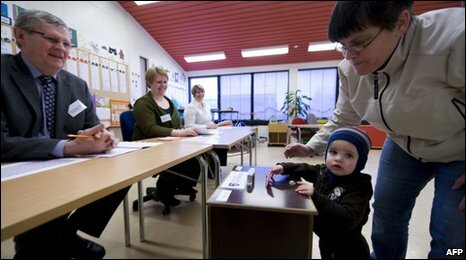 But Iceland's prime minister urged people to shun the referendum. Early provisional results from just 18,000 voters showed the "No" campaign ahead with a dominant 98% of votes. Talks between Iceland, the UK and the Netherlands three countries broke down on Friday without agreement. But Prime Minister Johanna Sigurdardottir said even she would not vote in Saturday's poll as her government was seeking to continue the negotiations. Opinion polls suggested the majority of voters will reject the referendum. As of Saturday lunchtime, turnout appeared to be lower than in last year's general election. Outside parliament in the capital Reykjavik, hundreds of protesters banged pots and waved banners reading "Icesave No! No! No!". A "No" vote could put billions of dollars of loans from the International Monetary Fund and other countries at risk. Finance Minister Steingrimur Sigfusson attempted to play down the significance of the referendum, called after President Olaf Ragnar Grimsson blocked the initial deal. "It's of utmost importance that we don't over-interpret whatever message comes out of this," he said. "We want to be perfectly clear that a 'No' vote does not mean we are refusing to pay. We will honour our obligations. To maintain anything else is highly dangerous for the economy of this country." Partial results are expected shortly after polls close at 2200 GMT. The government had hoped to avoid the vote by agreeing a new repayment plan before the weekend. Rarely can there have been a stranger referendum than this. Everyone here acknowledges that the deal that Icelanders are being asked to vote on has been superseded in negotiations between Britain, Iceland and the Netherlands over the past two months, so the current offer to Iceland is better than the one that is on today's ballot papers. The government would have liked to have scrapped the referendum. The prime minister has already said that she will not vote. Those who do make it to the polling stations will probably make a protest vote: there is real bitterness here about the way that Iceland has been treated by the Netherlands and especially by Britain. Foreign Minister Ossur Skarphethinsson told Reuters news agency he expected a new Icesave deal "in the next weeks, perhaps sooner". Britain and the Netherlands want the money as repayment for bailing out customers in the Icesave online bank, which folded in 2008 due to the global financial meltdown. President Grimsson rejected suggestions the vote was meaningless, telling the BBC that a strong "No" would strengthen his country's hand. "It's not a pointless exercise because the referendum, according to our constitution, is on whether the deal which the British and the Dutch insisted on at the end of last year, should remain in force as a law in this country," he said. "It is encouraging that in the last few weeks the British and the Dutch have acknowledged that that deal, on which the referendum takes place, is an unfair deal and that is by itself a tremendous achievement by the referendum. So, after the vote today, which I believe will be a clear 'No' vote, we will be able to continue the negotiations." 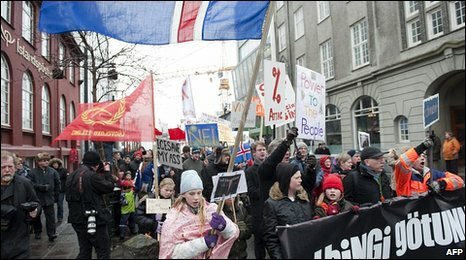 Many Icelanders believe the plan should be rejected because they feel they are being penalised for the mistakes of the banking industry. "I will vote 'No' simply because I disagree very strongly with us... having to shoulder this burden," Ingimar Gudmundsson, a lorry driver, told AFP news agency. "We want to pay our debts but we want to do it without going bankrupt," Steinunn Ragnarsdottir, a pianist who voted in Reykjavik City Hall, told Reuters. There is also anger against the UK for using anti-terrorist legislation to freeze Icesave assets in the country. Arni Gunnarsson, a former Icelandic MP, told the BBC News website: "We have not forgotten how Britain used battleships against Iceland during the cod wars. "We find this a very strange method of thanking the Icelandic people for sacrificing the lives of their seamen during World War II. "The colonial attitude is still going strong. The UK should come to its senses." The Reykjavik government approved the repayment plan last December but it was blocked by Mr Grimsson in January, which led to the referendum being called.